A video of a man killing a sleeping lion has led to social media outrage. The gruesome clip was shared widely on Twitter with people condemning the act. While trophy hunting is banned in many countries of the world, it continues in different parts. 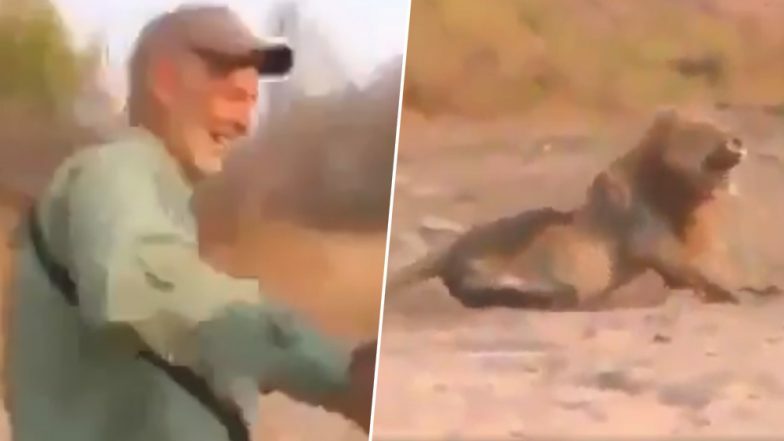 The video was shared by a Twitter handle PROTECT ALL WILDLIFE (@Protect_Wldlife) with the caption, "This 'hunter' sneaked up on a SLEEPING #Lion and killed it!" It further states, "According to the @NatGeo magazine, the Lion will have disappeared from the African continent in 2050!!!! RT if you want a GLOBAL ban on ALL #trophyhunting NOW!!" The video was massively shared on social media with people hitting out at the hunter and his companion who congratulated him for killing the animal at the first attempt." US Trophy Hunter Pays Pakistan Rs 77 Lakh to Kill Rare Himalayan Goat Markhor, Says it Helps Conservation! Comment by Twitter user Kevin Bishop reads, "What a pair of gutless creeps. The South African guide is the murderer the shooter is a mindless dumbfuck. How more disgusting can you get. Murdering a sleeping lion and then congratulating each other..it's money and no humanity, these people stink." Blake Fischer Boasts About Killing Family of Baboons, Asked to Resign for Trophy Hunting Pics From Africa. Comment by Chris Fleming reads, "I can't take this crap anymore you trophy hunters are weak spineless individuals - killing innocent animals because of ego- try that gun on me if you are so tuff! This is not a sport!!! I played football and baseball real sports!!! I'll Smack you if I meet you!! Trophy hunting is the killing of wild animals for human recreation, mostly human requirements. While the act is considered gruesome, some, unfortunately, think of it as an act of pride. US Female Hunter Trophy Kill ‘Rare’ Black Giraffe and Sharing Pictures of Her ‘Dream Hunt’ Sparks Outrage on Social Media. According to the African Wildlife Foundation, the current rate of lion hunting and poaching could make the animals go extinct by the year 2050. It says that lions have lost 85% of their historic range 100 years ago. While 100 years ago, the lion population was approximately 200,000, it is estimated as less than 23,000.